This Vintage Circa 1920's-Inspired Ballerina Round and Baguette Halo Diamond Ring by Auriya will take her breath away. 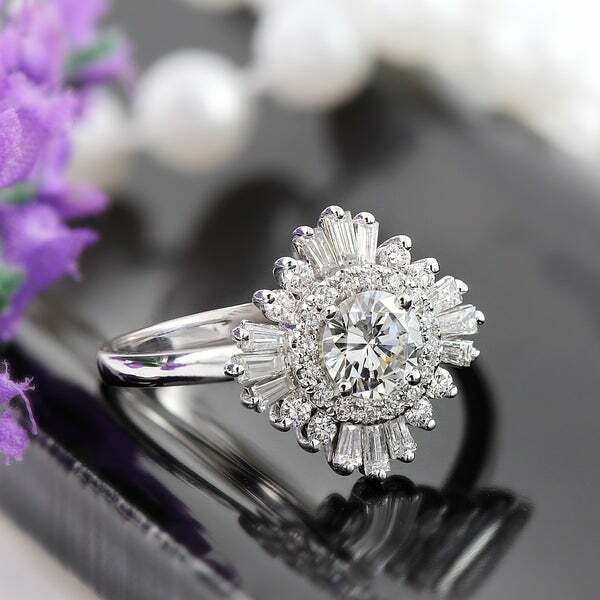 A 3/4ct certified round brilliant diamond center-stone catches your eye and is surrounded in a petite halo of shimmering white diamonds, and an array of round and baguette diamonds inspired by the art-deco, Gatsby generation, yet expertly crafted with today's modern sophistication. For the woman who appreciates old-world glam with an art-deco appeal, this stunning diamond halo engagement ring is a swoon-worthy way to show the world she is spoken for. Crafted in her choice of 14k Yellow Gold, White Gold or Rose Gold and finished with a lasting high-polish that will endure for generations to come.